The Truth has been hidden from us while a global policy of mass depopulation and exploitation has been carried out behind the scenes for the past half-century. The author, an independent journalist, became aware of this agenda only in the past few years. She found it hard to believe, but in-depth research and the testimony of whistleblowers worldwide have exposed these strategies. They include geoengineering (chemtrails), fluoridation of water supplies, GMOs, vaccinations, false flag terrorist attacks, and economic warfare by the group David Wilcock calls the Cabal. However, despite this grim reality, a positive shift of mass awakening is occurring worldwide. Tribunals are being established to prosecute elite offenders; revelations of hidden technology like free-energy and new economic models are being put forth. The author shows how humanity is claiming its rightful heritage as spiritual beings and charts the course of our elevation of consciousness. MASS AWAKENING gives us all real hope for an amazing future. 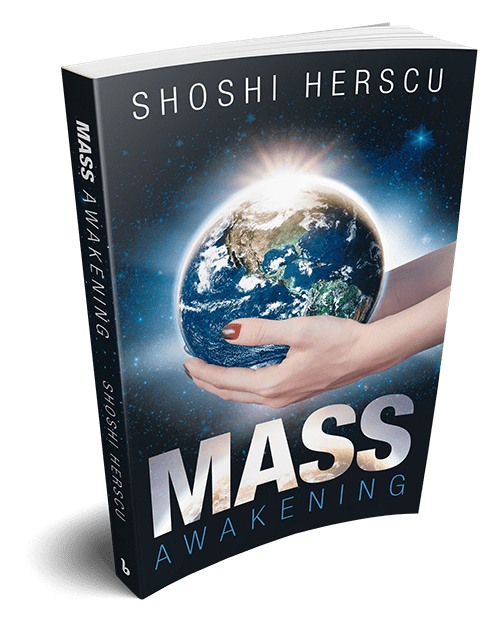 Mass Awakening is Shoshi Herscu’s well researched and yet profoundly personal handling of intensely shocking material, rarely covered in print. It is both a true inspiration and a much- needed breath of fresh air. Shoshi Herscu has an MBA degree from the University of Humberside in Hull, England (today, The University of Lincoln), and is a graduate (BA degree in English linguistics and special education) of the Hebrew University in Jerusalem, Israel.